I made Jamaican Jerk Chicken on Sunday and I have half a breast leftover. Checking out the Jamaican cook book, that Jan brought me back from England, I saw that it had a recipe for Caribbean coleslaw. If I put the chicken together with the coleslaw I could come up with the Jamaican equivalent of a Chinese Chicken salad. Of course, I view a cookbook recipe as a source of ideas and insparation, not a list of ingredients, so my salad is only a nod at the original recipe. Looking at Jamaican coleslaw recipes online, I found that most of them were mustard based, at least those that were written by Jamaicans. Many of the ones not written by Jamaicans were mayonnaise based with something Jamaican added, either jerk spices or Jamaican hot sauce. They all also seemed to make large amounts of dressing. If you used all of the mixture your salad would be over dressed. I finally decided to lightly dress my salad with my own spicy mustard dressing. After Dinner Note: The girls really liked this dish. It was light, refreshing and a good balance of crunchy vegetables and creamy fruit. 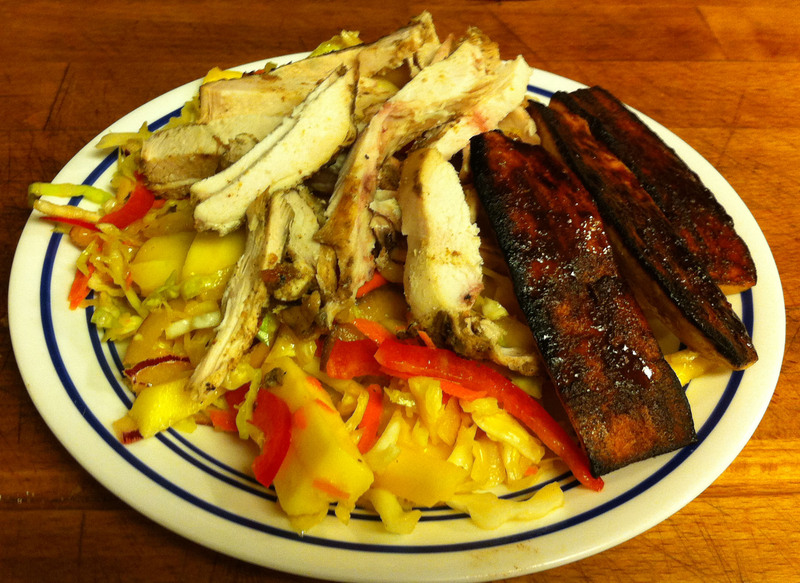 If you do not have any Jerk Chicken on hand and cooked chicken would do. 1. Mix the dressing ingredients in a small jar. Shake well and let it meld for at least 30 minutes. Shred the chili into very small strips. Tip: Today I am trying canola oil. The last time I used olive oil and it overran the other flavors in my cabbage salad. For a Chinese chicken salad I tend to use peanut oil. 2. Shred the cabbages and put them in a large salad bowl. 3. Cut the onion in half and then slice it very thin. Add it to the bowl. 4. Cut the red pepper and mango into large matchsticks and add it to the bowl. 5. Dress and toss the salad. 6. Add the chicken slices and serve. Tip: I prefer to serve the chicken on the side so that diners may take as much, or as little, of the chicken as it pleases them.